Now you've got a compelling reason to do the dance of joy! 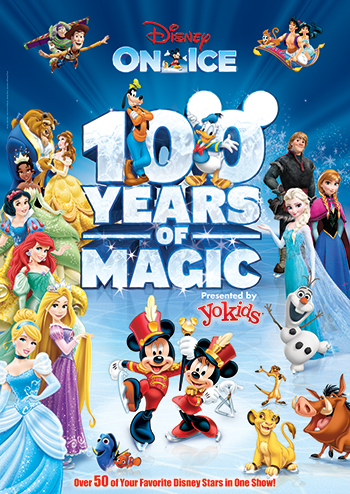 Disney On Ice: 100 Years of Magic is on tour and making their way to Hershey, Pennsylvania for a highly anticipated show at the Giant Center on Friday 5th April 2019. Fans are on the move to get first dibs on tickets to get the best seats in the house. So what are you waiting for? Get on your feet, get your groove together to make a run for those high-in-demand tickets! It takes a lot of work being the premier location for concerts in Pennsylvania and already this year has been huge in terms of the stars that have graced the Giant Center stage! Never resting on its laurels, Giant Center is committed to bringing you the very best in entertainment and remaining the beating heart of music in Hershey! Once again, it's time for fans to get excited as another incredible act gets ready to grace the Giant Center stage: Disney On Ice: 100 Years of Magic will be performing on Friday 5th April 2019!!! Understandably, tickets are selling very quickly, so make sure you don't miss out, and book yours today!